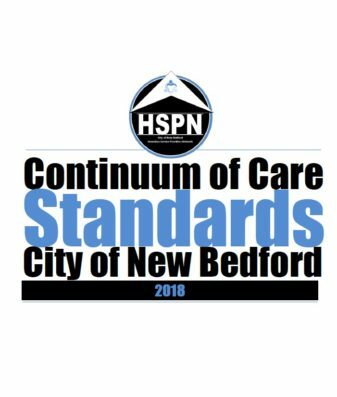 The HSPN follows a set of written standards in ensuring consistency, best practices and excellence with respect to program and system performance. These standards, memorialized in 2016 were updated by the City’s Department of Planning, Housing & Community Development on behalf of the New Bedford CoC. The product of that effort are the COC WRITTEN STANDARDS.2018 which clarify orders of priority as relates to survivors of domestic violence and adds valuable information as to the distinguishing features of ESG versus CoC rapid re-housing (RRH) programming. This updated document was unanimously adopted by the Executive Committee on behalf of the HSPN and now serves as the definitive standards currently in use.